The term ‘wastewater’ is a misnomer. Water should not be categorized as being wasted, it is too precious and valuable a resource. Instead, water that becomes contaminated and loaded with materials resulting from an industrial process, is just used, and it can be reused, again and again. Upcycling (up·cy·cle), also known as creative reuse, is the process of transforming by-products, waste materials, useless, or unwanted products into new materials or products of better quality or for better environmental value. In order to minimize trucking & hauling (very costly and produces lot of green-house gas emissions) of heavily contaminated water and allow industrial water users the option for reuse/recycling, two of natures most marvelous processes are put to work: evaporation & crystallization. In order to generate maximum UPWAVES™ at your plant or facility, Zero Effluent Discharge, or more popularly known as 'ZLD' from an industrial facility or complex, evaporation & crystallization can be applied, whereby generating a freshwater stream and a high solids sludge, that can be land-filled, incinerated, or sent for further refinement if there are valuable, recoverable materials present. 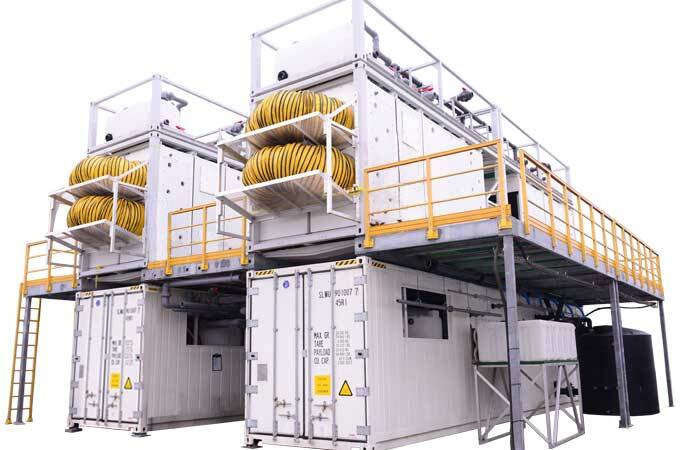 These systems are completely modular, pre-engineered, and come in 3 standard capacity sizes to treat an inlet flow of: 30 m³/day, 100 m³/day & 400 m³/day. If you have a heavily contaminated water stream, resulting from any production processes, then you are a potential candidate to benefit from UPWAVES. There are a few factors that we can look at with you to identify the viability of pursuing a Zero Liquid Discharge (ZLD) or Zero Effluent Discharge, therefore, we are pleased to work with you in developing a cost benefit analysis, identify the savings you could gain from less frequent and smaller volume of by-product that would have to be trucked off site. Free Desktop Engineering study to assess: initial plant sizing, performance & economics. Operate small scale pilot unit on your site to obtain more data and performance optimization. Please contact us start investigating your potential savings from UPWAVES. We are fully committed to working to solve your problematic water issue, therefore we can also deliver the entire project or work with partners of your choice. © COPYRIGHT 2019 HOMES Water ALL RIGHTS RESERVED.